There are many reasons why companies use 070 Personal Numbers - from Classified Adverts, Dating Services, Personal Chat and Hospital Patient Contact lines + many more! 070 Personal Numbers are just one way to protect your identity when you need to hide the actual number being called. You can mask your mobile or landline number with an 070 number within minutes, and for free! 070 Numbers are often referred to as 'Personal Numbers' or 'Follow Me Numbers'. They sit before your real mobile or landline number to hide your personal phone number. 070 numbers are virtual numbers so you do not need a separate SIM card or phone to use one. Our service is completely free. It doesn’t matter if you just want to set up one 070 number, or if you want to open a service provider account to earn revenue from your customers. There are no registration fees, no maximum usage and no hidden charges. If you are interested in becoming an 070 numbers service provider our competitive pay out rates can be seen here. Within my business, there is a lot of people working for me. 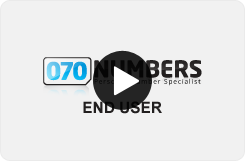 070 Numbers have helped us keep their personal phone numbers private to clients and customers. It's great! 070 Numbers have helped relieve the worry of unknown customers having my personal number. Now i can hide my number with an 070 number for business purposes. In my business, i have to make a lot of averts to customers. But the great thing about 070 numbers is that i don't have to put my personal number on there, i can use an 070 number! Copyright © 2019 070Numbers.All rights reserved.